You would like to go on an exciting excursion with „your“ children, but don′t just find enough time because of those “thousand little things of life”? Or are you planning something “for in between” to do with your fellow Au Pairs from the Spanish course? 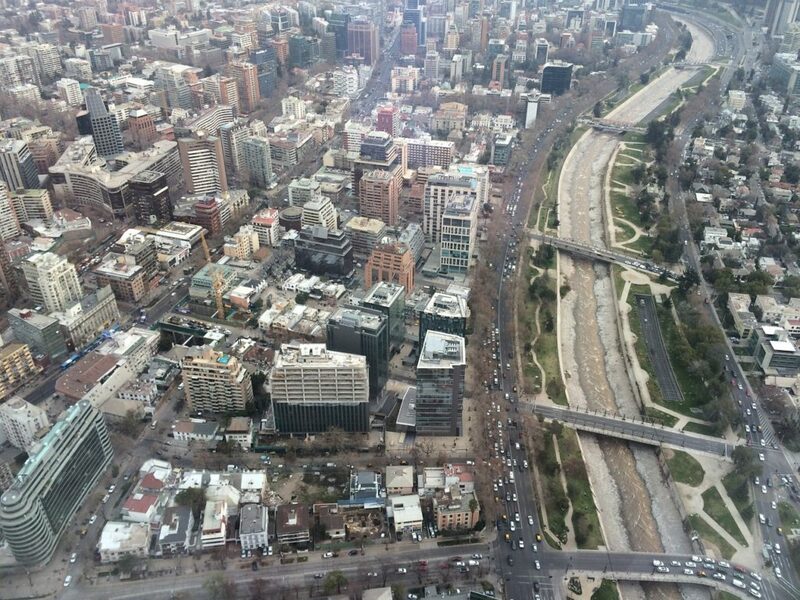 Then, a visit to the spectacular observation platform called “Sky Costanera” on the 61st and 62nd floor of the Costanera Center ′s tower in Providencia is just the right thng for you. The 300m tower is currently the tallest building in South America. The observation platform offers a breath-taking 360° panoramic view of the city, with visibility on good days reaching up to 50 km into the surrounding region. Given clear skies, even the ski centres in the Andes are visible. Information boards explain the most important sights of the city, like the presidential palace “La Moneda” or the National Stadium, and make orientation easier for its visitors. With children it is fun to play: Who finds our house (or at least, our neighbourhood)?, Who finds the school? Where does Granny live? Where have we been before…? The elevator ride up might leave you with a queasy feeling, since the speed is speed of up to seven meters per second and the whole ride up to the top does not last more than 40 seconds, but it′s worth it! Santiago’s highest highlight can definitely withstand international competition and offers an excellent opportunity to discover the city from a new perspective. Spectacular multimedia support is provided by the Sky Costanera app, available for Appla and Android. The app not only shows you important tourist attractions, but takes you on a time travel: While you look at today’s Santiago, the app shows you how the city looked at different times since 1541 – very exciting and interesting for the whole family! Opening hours are daily, including holidays, from 10 am to 10 pm, last ascend 9 pm.